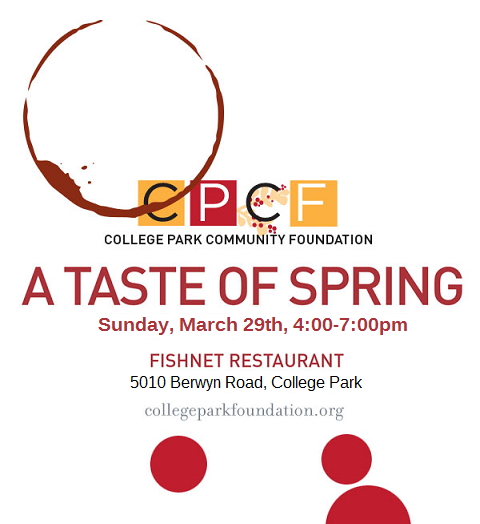 College Park Community Foundation invites you to the 2nd annual celebration of A Taste of Spring, an afternoon of community fun with local beer, fine wine selections, and delicious food provided by chef Ferhat Yalcin of Fishnet. We’ll also have a raffle with food and drink-themed prizes, and a contest to determine the favorite wine and beer selections of the day. All proceeds from the event will go towards the College Park Community Foundation’s grantmaking programs. A Taste of Spring is brought to you by the College Park Community Foundation and Fishnet. Tickets are available online.